Learning new skills for writing a check. 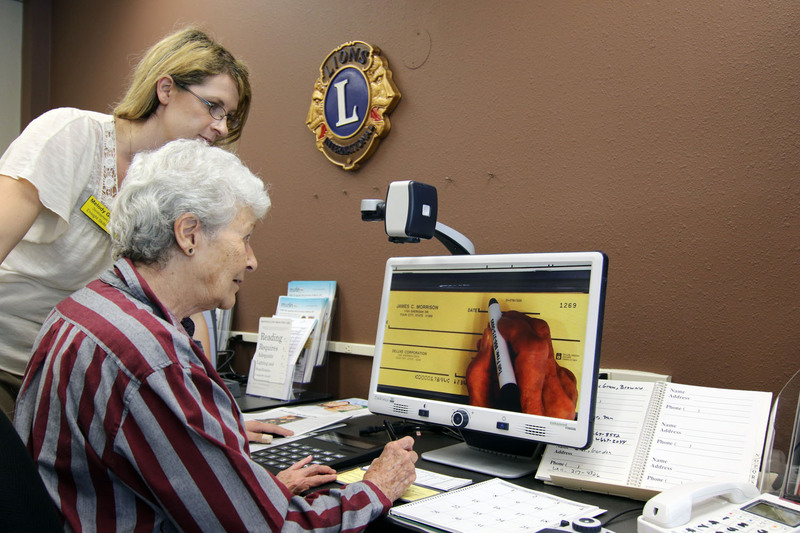 Opened in 2001 through a partnership with the Fort Collins Lions, The Ensight Skills Center serves anyone having difficulty with activities of daily living related to vision. Vision loss has many causes. Some of the most common causes of vision loss are degenerative eye diseases like macular degeneration, glaucoma, and diabetic retinopathy. In most cases, there are no medical treatments that will bring vision back. This is when visual rehabilitation services can help optimize the use of remaining vision through training and adaptive aids. It is the mission of the Ensight Skills Center to provide clients with low vision the opportunity to enhance their life skills, independence and self-confidence in a safe environment through training and adaptive technology. 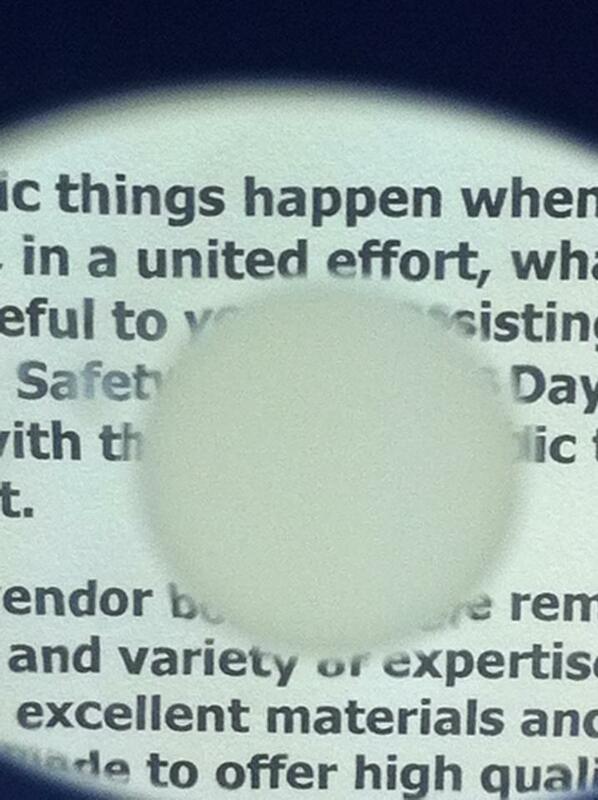 Ensight has many optical and non-optical low vision aids. These aids are prescribed by a low vision Optometrist. Ensight’s Optometrist focuses on evaluating a patient’s remaining vision and determining which optical low vision aides will help the most. Vision loss has many causes. Some of the most common causes of vision loss are degenerative eye diseases like macular degeneration, glaucoma, and diabetic retinopathy. In most cases, there are no medical treatments that will bring vision back. This is when visual rehabilitation services can help optimize the use of remaining vision through training and adaptive aids. The journey to independence starts with a low vision evaluation. Ensight has offices in Larimer County (Fort Collins), Weld County (Greeley), Boulder County (Lafayette), Denver County, Douglas County (Parker), Jefferson County (Lakewood), and Arapahoe County (Littleton). Our services benefit those living with visual impairments that are not correctable through medical intervention. Technology has revolutionized daily life for people who are blind and visually impaired. The power of computers, cell phones, and GPS systems has now brought our world within reach for those unable to see. Assistive technology, including specialized hardware or software that “speaks” or magnifies the computer screen, or renders hard-copy output into Braille, has changed the lives of countless individuals with low vision. I would like you to think about everything that you do on a day to day bases that involves the full use of your vision. Now imagine what the might be like with the disruption of your central vision. The vision that you use to make out detail and fine tune your surroundings. Imagine that your peripheral vision is damaged. Peripheral vision is a part of vision that occurs outside the very center of gaze. This is the vision we use to see the world around us. Tasks like reading, cooking, and card playing might suffer and soon become a distant memory. Socializing with friends and family might become difficult. You might feel safest at home, so that is where you remain. These are all areas that our clients at Ensight have struggled with. These are also areas where our clients have found hope and learned skills to continue on. Occupational therapists will perform an evaluation of the effects of vision loss and the ability to complete daily activities followed by training on the proper use of the optical and non-optical aids. Training will focuses on learning to use light and magnification, to help with reading, cooking, medication management, financial management, home mobility and safety. Basic training can be done at Ensight, but training is also done in the patient’s own home or workplace. Video magnification systems like closed circuit televisions (CCTVs) and portable video magnification devices. Computer hardware and software that provides screen magnification, synthesized speech, tactile display, or combinations of these. Assistive devices for daily living, like talking scales, talking glucometers, color identifiers, talking compasses, and a variety of other devices. The Ensight Skills Center is a 501©3 not-for-profit organization that provides visual rehabilitation. We are the only fully comprehensive Low Vision services in Colorado. The low vision community depends on Ensight programs to help them regain and preserve independence and quality of life.